Dream In Darkness: Wow! CT Nan~ Getting Ready for Kick Off of Dream in Darkness Challenge May 1st!! Wow! CT Nan~ Getting Ready for Kick Off of Dream in Darkness Challenge May 1st!! We will be showing you some of our dark side on the days leading up to the challenge start so keep checking in to see what our fabulous Creative Team comes up with! We are going to do a separate post to introduce them to you as we want to show them lots of love because they are fabulous! I am jumping in first, I'm Nan and here is my canvas (excuse the lighting the shine on the canvas didn't cooperate)! 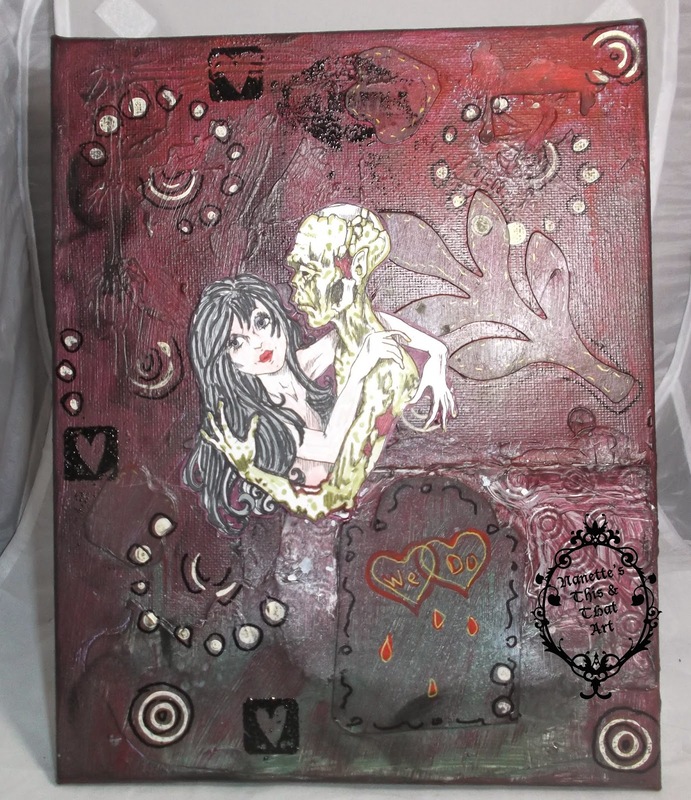 We are being sponsored for our first challenge by the wonderful Rick St. Dennis so in honor of that I am showing you a canvas I made with his image "Zombie Love" from my stash. I colored the image with Chameleon pens, fussy cut, glued, and edged with a dark red pen to hide the white lines around the image. I used cardstock layered, stencils, spring caps, a bead circle, and home made gesso to layer it up. I doodled with a gold jelly pen on their romantic headstone and a black marker around and about here and there. Looks like true love to me! Thanks for having a look and get those wheels turning so you can enter the first ever challenge at Dream in Darkness coming to haunt you May 1st! Get the rusty gears grinding and turning... you can use any image, stamps, or no image or stamps, mixed media, altered art, 100% digital....just make it dark, please! This is not for cute cards even though we love them, but this is for all of us with that urge to create something different and few places exist for us out there. Happy Crafting from the Dream in Darkness Creative Team!! Am waiting impatiently but loving your canvas! Gorgeous canvas Nan I love the way you create your background, fabulous image too. Thanks Rose! Kim taught me the basics of canvases...but hers are amazing! You will see some of hers very soon I am sure! Have a great day! Guess What Time Is Drawing Near? CT Anne Heading Towards the Start! !